A monumental biography of the subcontinent from the award-winning author of The World Is What It Is: The Authorized Biography of V. S. Naipaul. Second only to China in the magnitude of its economic miracle and second to none in its potential to shape the new century, India is fast undergoing one of the most momentous transformations the world has ever seen. In this dazzlingly panoramic book, Patrick French chronicles that epic change, telling human stories to explain a larger national narrative. 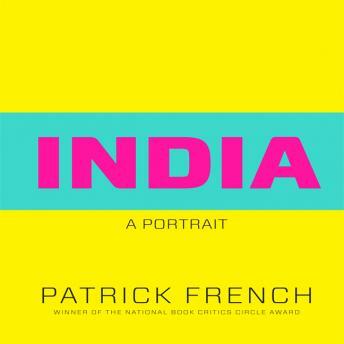 Melding on-the-ground reports with a deep knowledge of history, French exposes the cultural foundations of India's political, economic and social complexities. He reveals how a nation identified with some of the most wretched poverty on earth has simultaneously developed an envied culture of entrepreneurship (here are stories like that of C. K. Ranganathan, who trudged the streets of Cuddalore in the 1980s selling sample packets of shampoo and now employs more than one thousand people). And even more remarkably, French shows how, despite the ancient and persistent traditions of caste, as well as a mind-boggling number of ethnicities and languages, India has nevertheless managed to cohere, evolving into the world's largest democracy, largely fulfilling Jawaharlal Nehru's dream of a secular liberal order. French's inquiry goes to the heart of all the puzzlements that modern India presents: Is this country actually rich or poor? Why has its Muslim population, the second largest on earth, resisted radicalization to such a considerable extent? Why do so many children of Indians who have succeeded in the West want to return "home," despite never having lived in India? Will India become a natural ally of the West, a geostrategic counterweight to the illiberal rising powers China and Russia? To find the answers, French seeks out an astonishing range of characters: from Maoist revolutionaries to Mafia dons, from chained quarry laborers to self-made billionaires. And he delves into the personal lives of the political elite, including the Italian-born Sonia Gandhi, one of the most powerful women in the world. With a familiarity and insight few Westerners could approach, Patrick French provides a vital corrective to the many outdated notions about a uniquely dynamic and consequential nation. His India is a thrilling revelation.